Bathrooms can turn into a mess in no time whether we like it or not. As time passes on, many of us have the habit of hoarding bath supplies & toiletries, which keep spilling out of cabinets or strewn all around the vanity. Its not all our fault though! Some bathrooms are too tiny to accommodate all our shower essentials, or some are just too hard to organize that you are running from one end to another to fetch your toiletries. This is where shower caddies can come pretty handy in organizing and tidying your bathroom space giving you a sense of calm. Shower caddies are mostly on point with their storage and easy-to-install nature. They can of many varieties such as – hanging, screwed to a surface, held through suction cups or can be free standing. As you can imagine with a lot of designs and makes, it may prove to be a bit confusing for you to choose what exactly would be right for your bathroom. After spending enough time browsing for caddies, we have filtered through a vast number of options to bring you some of the best shower caddies in terms of design, aesthetics, storage, and, last but not least, their durability. So waste no time and indulge right away to find the best caddy that suits your needs and bathroom. If you’re looking for an inexpensive and no-frills, yet simple solution to store bath accessories, then you certainly can’t go wrong with the Attmu Mesh Shower Caddy. It is an easy-to-clean-and-carry tote bag that can effortlessly tidy your bathroom space by nestling your entire bathroom essentials inside. Suitable for dorms, or bathrooms with many users, this shower bag is made of high-grade mesh which doesn’t let water stagnate, and can be dried easily. You will have no trouble finding your toiletries as this caddy comes with 8 outer compartments and a large one in the centre to store shampoo, razors, and soaps, to combs and toothbrushes, all organized and ready to grab. The mesh tote bag is machine washable, tough and sturdy, and can last many years. Lastly, the caddy is equipped with a strap or a handle which is not only easy to carry but can also be fastened to a hook or peg. The Attmu Mesh Shower Caddy may not turn heads with its simple design; it’s more preferred by college students and usually found in dorm rooms or small bathrooms. 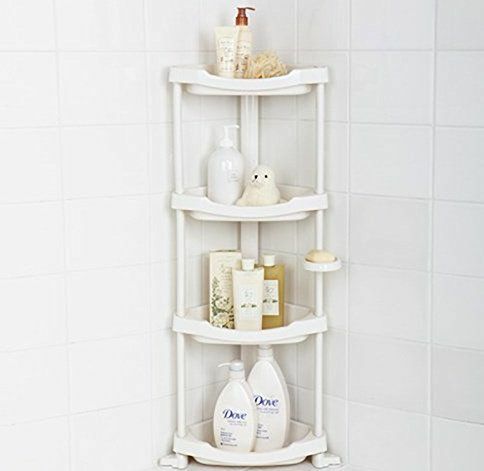 This shower caddy from Tenby Living is an excellent free-standing corner storage option for your bathrooms. With its build fabricated in plastic, the caddy works great against corrosion and mould, and is essentially rust-free. If you are worried about it’s strength, fret not as the plastic material is sturdy and durable, allowing you to store a whole lot of your essentials. The corner shelf organizer has customizable storage options where you can have 2 to 4 shelves suited to your specific requirement. You can even find a small soap rack jutting outside the frame for you to readily grab that bar of soap. All the shelves are supplied with holes in their bottoms to drain water and prevent mildew or mould. There’s also an adjustable feet design that prevents the caddy from wobbling or slipping when the floor is wet. As with any free standing caddy, it takes up a certain amount of floor space; do take note to see if you have bathroom has ample space to support it. Although inexpensive, the major issue with such simple plastic shower caddies is the accumulation of bacteria on the flat surfaces and their short-term usability. This trendy and stylish caddy is a great choice when it comes to tidying your bathroom, especially when you have a neglected corner space. The BESy shower caddy is a nicely designed corner shower caddy with two shelves which can accommodate all your shower accessories. Fashioned out of high-grade stainless steel and a lustrous chrome finish, the caddy is slated to be corrosion-free and rust-proof. The shelves of the BESy corner caddy are highly durable which can bear the brunt of heavy bottles without tilting or warping to a side, and is also supplied with small holes at the bottom for drainage. The best feature of the caddy is that it is easy to install and can be fixed without the need for drilling or suction cups. It has a self-adhesive glue that can be fixed to any smooth and clean surface. Also, you can easily remove the caddy and re-install it in another location without affecting your tiles or wall. The simple and sleek storage offered by the SANNO stainless steel bath caddy can easily complement your bathroom, or even your kitchen. Coming in a set of three, you can have a soap rack, hooks for your towels and washcloths, and a large basket suitable for holding shampoos and other bath items. The suction cups of the caddy can be fastened to a smooth and flat surface like tiles, glasses, acrylic, etc., and comes with a two-year guarantee. It can also support quite a load allowing you to store your big shampoo bottles and conditioners. Made out of stainless steel, the caddies are durable and rust-proof while also resisting everyday wear and tear. In fact, the baskets are hand-polished, meaning it works well against scratches and tarnishing that comes with everyday use. However, the caddy cannot be installed over porous surfaces like painted walls or bumpy surfaces such as natural stone ones like travertine, and such. Also, the suction cups may have a tendency to loosen over time with exposure to moisture and steam. An over-the-door shower caddy can be exceptionally convenient in bathrooms with absolute minimal storage space. The InterDesign Metalo caddy can be effortlessly fitted over the shower door or any wall of 2-inch thickness without the need of any tools or screws. There are two suction cups provided at the bottom to hold your caddy in place. It is pretty versatile in nature with its four storage racks, out of which the two in the centre can be swivelled to a full 180-degree outside the caddy frame allowing you to place large bottles in the lower rack. It also has two towel hooks shaped behind the caddy, making it convenient to hang your towels or robes outside the shower without it getting wet or soiled. Talking about the build, it’s got a steel wire construction with a satin silver finish which gives the caddy a refined look. Though the product is slated to be rust proof, there has been a bit of talk about potential rust build-up. This smart tension caddy from Simplehuman could be fashioned in any bathroom with heights ranging from 6 to 9 feet. The wireframe shelves are adjustable allowing you to simply slide them vertically or sideways to make room for storage. This feature especially comes in handy when you have no ledge spaces or cupboards. You can configure the caddy in different ways– from three to four shelves, or having a towel rod, among others. It also has a built-in toothbrush and razor holder; interestingly, the wired bottoms have cut-out holes enabling you to place bottles upside down which makes dispensing easier. Also, the reinforced Aluminium pole features strong rubber grips and a high-compression spring ensuring a secure fit. However, despite all that, the product isn’t without its downsides. Customers have complained that the product isn’t completely rust-free as claimed, as the wired bottoms may develop rust over time which is both weakening and an eyesore to look at. Also, the baskets have rims at a very low level leaving bottles and other containers to occasionally topple and fall off. This stylish and trendy shower caddy from InterDesign sports a firm steel structure with two super-large shelves accommodating all your bath accessories quite comfortably. 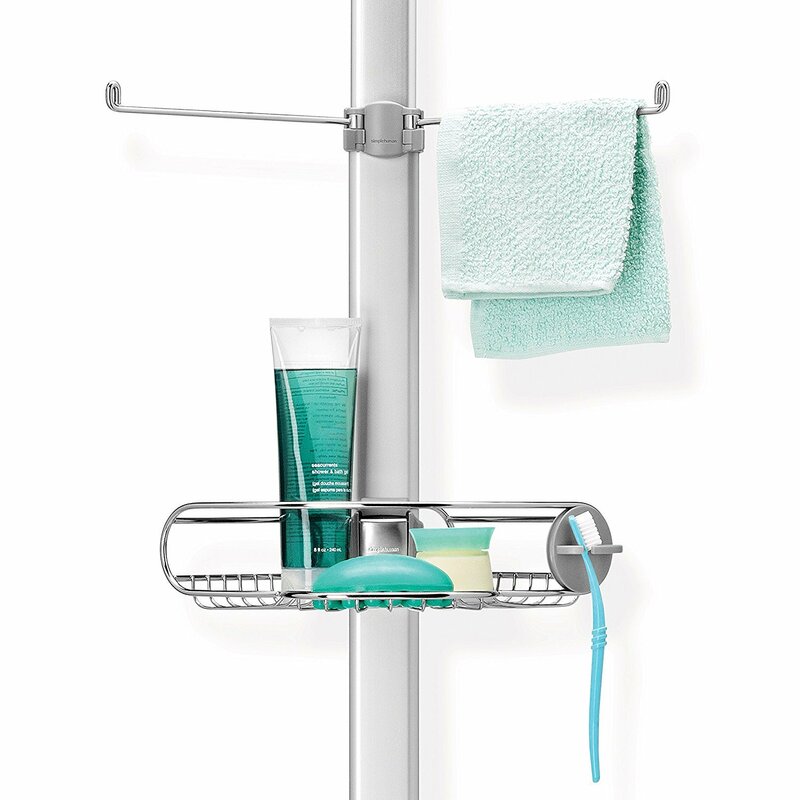 This hanging shower caddy can be suspended from your shower head while suction cups are provisioned at the rear to hold it in place. 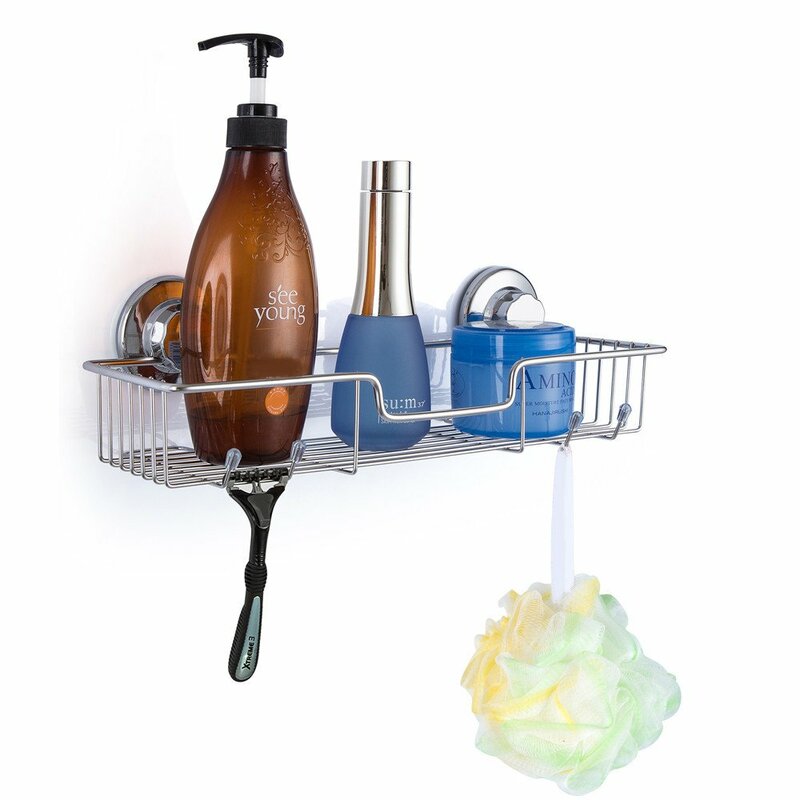 The racks of the York Lyra caddy have a wire mesh build making it easy for water and other remnants to drain thoroughly, giving you a place to store your soaps, shampoos, and conditioners without worry of mildew. The caddy itself is wide and big enough to be integrated with any showerhead. 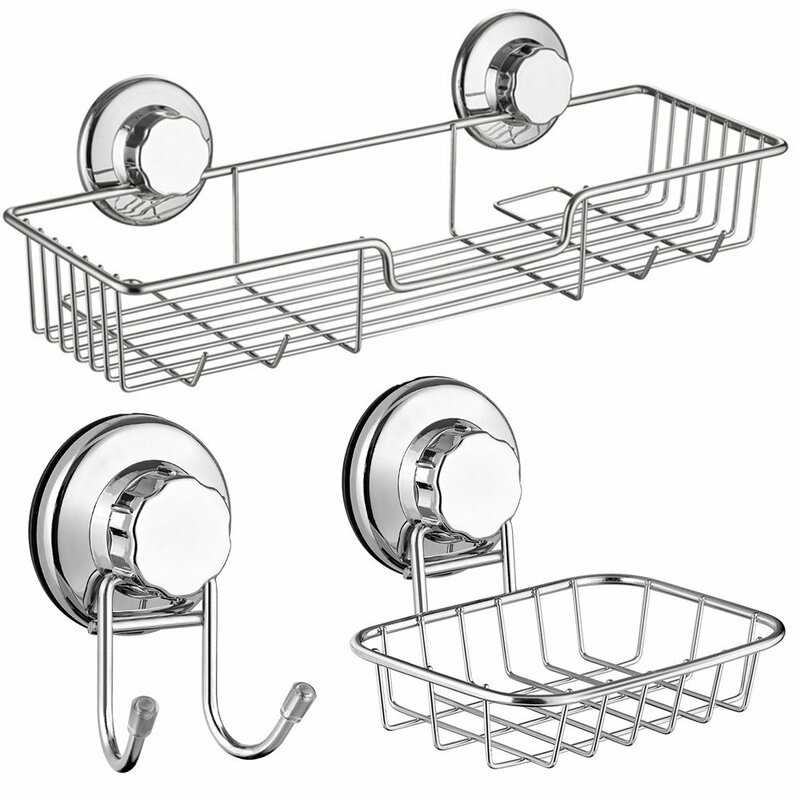 Additionally, you can find a few sets of integrated hooks to hang razors, loofahs, or even a washcloth. Its beautiful silver finish is rust-free in nature making it a great addition to your bathroom that promises to last long. A small downside is the common complaint that the suction cups give a bit of an issue– that they are a little too flat and may come loose. The ShowerGem, being transparent, enhances the texture of your bathroom walls instead of hiding it! The ShowerGem shower caddy is an exceptionally trendy product to store all of your toiletries in a very aesthetic manner that doesn’t affect the décor of your bathroom or shower. In fact, if anything, the ShowerGem enhances your bathroom’s appeal! No more trips to your closet to get your tubes and shampoos, and no more lamenting that you haven’t got any corners to store. 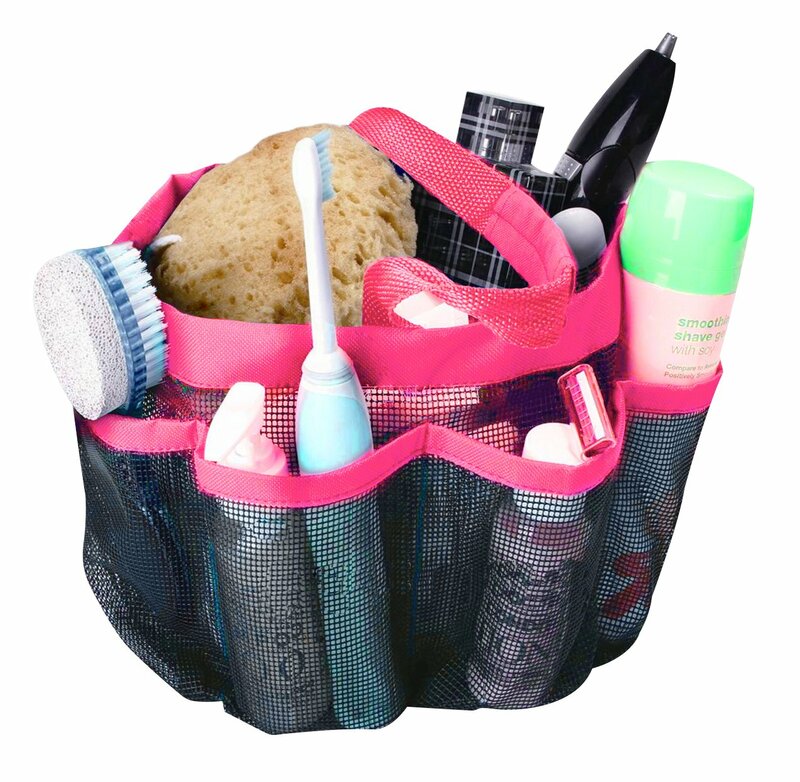 The ShowerGem caddy can perfectly store all your shampoos, soaps, cream tubes, razor and loofah without any hassle. In fact, each piece of this caddy is specifically designed to hold three bottles, soap, a razor, and a loofah. This elegant and simple shower caddy occupies very little space and goes well with any given bathroom space, thanks to its transparent and soft design. Also, the fact that it is exceptionally easy to install without the need for additional tools for drilling or dealing with suction cups, makes it the best shower caddy on the market. All you got to do is fasten the caddy on to a smooth surface with the aid of specially engineered glue which is supplied alongside, making it a modern, tidy bathroom organizer. The ShowerGem uses high-grade engineered plastic which is guaranteed rust free and corrosion resistant. The perfect shelf design of the ShowerGem caddy can seamlessly hold well even in wet shower conditions and can support bottles of up to 1 Litre. The presence of drains at the end is a welcome feature to remove excess water preventing mould build-up. 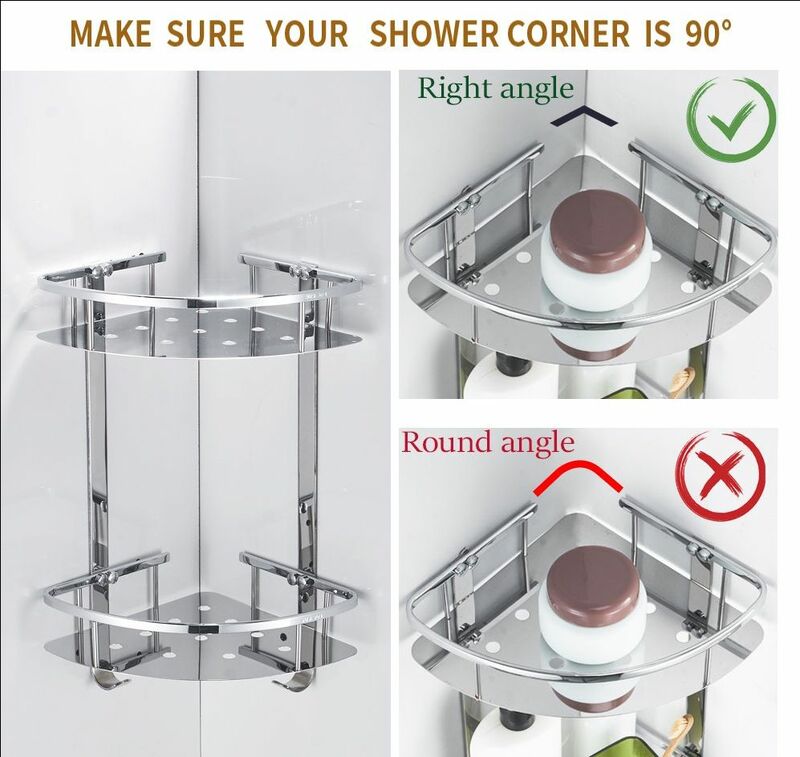 With its durability and high strength, it can serve your shower a very long time. Clearly, it’s the best rustproof shower caddy we all need this Spring.